An interesting Cliff Robinson front cover with the two generations of 'Giant' split down the middle. This is an issue celebrating John 'Giant' Clay and his son and grandson. 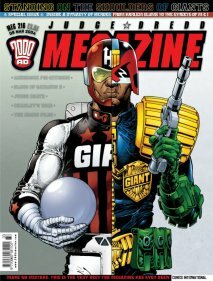 In his editorial, Alan Barnes derides 2000 AD for taking Judge Giant from us and leaving us all distraught (he was killed by Sov agent Orlok in the Apocalypse War saga). So he is righting that wrong by dedicating this Meg to his legacy. Lets go in chronological order. In the reprint section, Wagner and Ezquerra present us with the story Young Giant set in 2111 AD. Dredd is asked to take young Cadet Giant out on to the streets to assess if his fiery temperament can ever be controlled. Dredd was about as close to his father, Judge Giant, as Dredd ever gets to other people so it is interesting to watch the relationship with the young man evolve over the story. Will Giant be able to face his worst fear and conquer it? Good story this, detailing the history of Cadet Giant and how he came to be where he is now. It's about as fatherly as we are likely to see Dredd, and he really chucks the youngster into the deep end. Sink or swim? Now to 2126 AD and the story Prodigal, where Cadet Giant is now a Judge. Whilst on crowd control, he meets Rico, another clone of Fargo like Dredd. This is quite an action-packed story with gunfights and car chases - the trademark of Gordon Rennie. These are my favourite kind of Dredds. Interesting that the man himself never makes an appearance in this, and had this been written today, I would be wondering if we were seeing the changing of the guard. Would Dredd be making way for a new breed? Of course, he didn't, he's still very much with us today, but this story definitely probes that possibility. Simon Davis is on art duty, and whilst there is no doubt the man can paint, I didn't feel his style was able to keep pace with the fast, action script. Staying in 2126 AD, we have the continuing saga of What Ever Happened To... and this issue it is John 'Giant' Clay - of Harlem Heroes fame. Clay is very old and only has a few months to live, when he is visited by his grandson, Judge Clay. This is another Rennie story, with art by Rufus Dayglo, and shows that Rennie isn't all gunfights and action sequences. He does human stories very well too. I thought it was a genuinely touching story, with a lovely ending. Fine work by both writer and artist. In other stories, we saw the end of the Judge Death saga The Wilderness Days. It was a good ending for Jay D, and one that could easily be picked up in another storyline. On balance, and despite some of the repetitive story lines, I enjoyed this one. In particular, Frazer Irving's artwork.. Blood Of Satanus II: Dark Matters kept the pace high. Still not convinced by the art work, but the story is suitably dark and gory. I did have a slight problem with some of the dialogue Mills chose to use, particularly the line "Let's do some judging" which I can only imagine Dredd uttering after a few tins of Special Brew and a couple of lines of coke... Still, that aside, I'm enjoying the one. What's not to love about a dark cult trying to bring back a man-eating, psychopathic T-Rex! Onto the text articles, and The Dredd Files continued is crawl through the archives (yawn) and we had Dreddlines and that was it. I guess there simply wasn't the space for anything else as it was a pretty busy issue. And finally... We seem to have lost the intros to the Gold reprint section and the Daily Star Dredds have gone again. Appreciate space was at a premium, but the intros really did help put the older stories into perspective.